The slides from Democratizing Data Science, the vision paper that William, Ramesh, and I presented for KDD @Bloomberg on Sunday are now available online. What a great first conference experience! Really interesting speakers and projects all around. Take part in the conversation by tweeting at us (@mpetitchou, @tweetsbyramesh, @williampli) or putting your own opinions and experiences out there. Guys! Guys! Guess what. 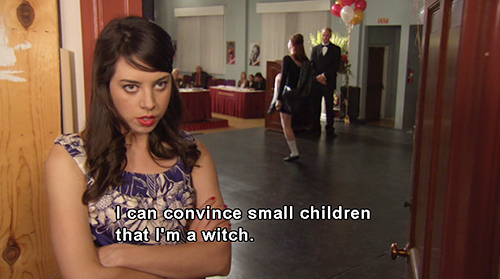 Even though I’m practicing my April Ludgate glare in real life, today I’m going to be more like this. Why? I co-wrote my first paper with two cool cats at MIT CSAIL, William Li and Ramesh Sridharan, and it got accepted to the KDD Conference as a highlight talk! That means next Sunday, August 24th you can hear me taco ‘bout it in real life at 11am in the Bloomberg Building, 731 Lexington Avenue, NY, NY. The theme of this year’s conference is “Data Mining for Social Good”, and our paper is a short vision statement on effecting positive social change with data science. We briefly define “Data Science”, ask what it means to democratize the field, and to what end that may be achieved. In other words, the current applications of Data Science, a new but growing field, in both research and industry, has the potential for great social impact, but in reality, resources are rarely distributed in a way to optimize the social good. The conference on Sunday at Bloomberg is free, and the line-up looks promising. There are three “tracks” going on that morning, “Data Science & Policy”, “Urban Computing”, and “Data Frameworks”. Ours is in the 3rd track. Sign up here! For the full text of the paper, click here. I’ve compiled a short list of resources on Sentiment Analysis, especially as applied to (political) debates. Check it out on the Govlab blog.